The Additional Forms feature is available by request for a fee. If you're interested in using Additional Forms, please contact our account management team. 2. Click the blue New Form button in the upper right screen area. 3. Enter a Form Name. Next, drag and drop form fields from the Toolbox on the left into your form. Below are brief descriptions of the form field tool options you have for building your form. Name - Provides 2 entry boxes for a first and last name. Address - Provides entry boxes for address collection. Before adding this field, you may want to be aware of the Require Address feature which auto-collects this information from submitters prior to them filling out any form on your site. Short Answer - Provides a one-line text box for short typed responses. Long Answer - Provides a larger text box for long typed responses. Single Checkbox - Provides a single checkbox accompanied by a textual statement. This form field is often used for something like asking a submitter to acknowledge terms or condition by checking the box. Single Response - Enables the creation of a list of choices, from which an applicant or submitter can choose only ONE of the answers provided. File Upload - Enables submitters to upload text, image, video, audio, and specialty files. Up to 74 files can be uploaded per file upload field. Table - Upload a responsive spreadsheet that can be filled in when a form is live. Number - Request a response that must be a number. You can set a minimum and maximum number entry. Date - Request a date from applicants. A date picker is conveniently available and date range can be selected. Phone - Form field used to request a phone number. Cover Letter - If a submitter has a cover letter saved in their profile, the text of that lever will automatically populate into a cover letter field. Text Only - Use this field to provide information or instructions only. There will not be any response options for this field. Divider - Inserts a dividing line between any two fields to delineate separation and/or organization of form sections. 5. Click Save Form when you're finished creating your form. Then select Return to list. Note: You can duplicate entire additional forms, as well as any form fields within an Additional Form, by clicking on the copy icon shown below. When you click the copy icon, a duplicate (form or form field) will appear instantly. If your form field already had content entered into it when you click copy, that content will also be duplicated. You can also move the position of any form field by clicking and holding on the dot pattern in the upper left of any form field. Once you click and hold the dot pattern, you can use scroll or your mouse to move the form field up or down in the form, then release to place it in the desired position. 1. In your Submissions list, select the checkboxes next to the submission(s) from submitters whom you'd like to contact. Then, click the Additional Form button (shown below) at the top of the Submissions list. 2. In the Additional Form dialog box, select the form you'd like to use and type in a Unique Name for the form. 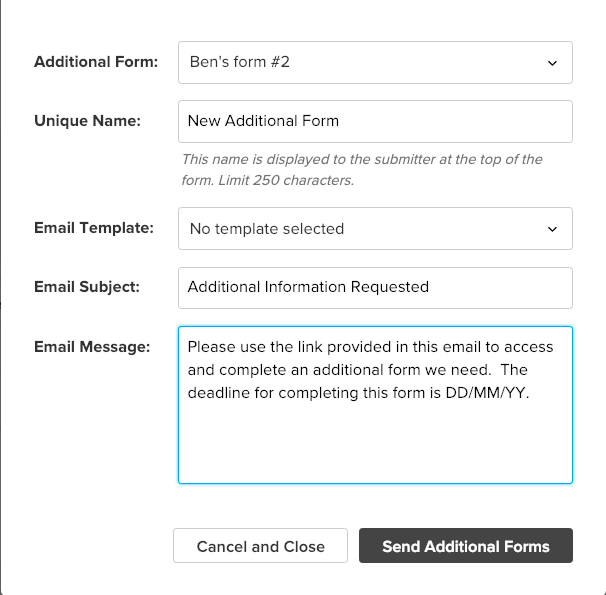 The submitter will see the Unique Name at the top of the form. Note: You can also send Additional Forms within the Submission Details page of a specific submission. On the Submissions Details page, select More > Send Additional Form. The Additional Form will only go to the submitter who sent that specific submission. 4. The submitter(s) will receive an email containing a link to your form. After they fill out and submit the form, you will receive an email notifying you that the form has been completed. You can see the form data when you click on their submission and expand the Additional Form located at the top of their Submission Details page. 5. You can also check the status of an additional form by locating the submission associated with it in the Submissions List. A submission for which an additional form was sent will have an Additional Form icon located to the far right of the submission.